Wat : OMG !!! Aren't they CUTE ?! 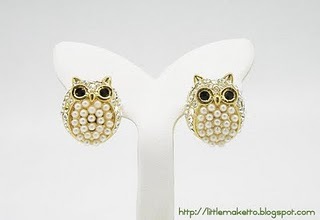 Look at their eyes, their stare is just captivating .. Quick go get a pair of this pair of cute owl earrings for yourself. Wat : Look fashionable in this whitecolour dress ! Suitable for formal occasions and also parties ! This dress has a big ribbon tied in front, surely a good catch ! Wat : Get yourself a semi mini dress ? I don't know if you agree with me .. but it is kinda difficult to get a skirt that is of the right length. This skirt seem to be a little longer than a mini dress.. makes it easier to sit. Wat : Go have a look at their newly launched series of pumps. The pumps above are part of their dual colour flats collection. Looking for some comfortable yet nice footwear ? Head to their site now !